We’ve become friends with a farmer. I think it was one of my goal in life to be a friend with a farmer, having constant resource to what’s in season locally and how to best use the ingredients they grow. Well, Clinton from La Nay Ferme, is easy to like. He is not your typical farmer, in fact he’s a lot more like you and I than most farmers you know. He’s a young guy who left his computer gig to start a farm. Somedays I wish I could do just the same. 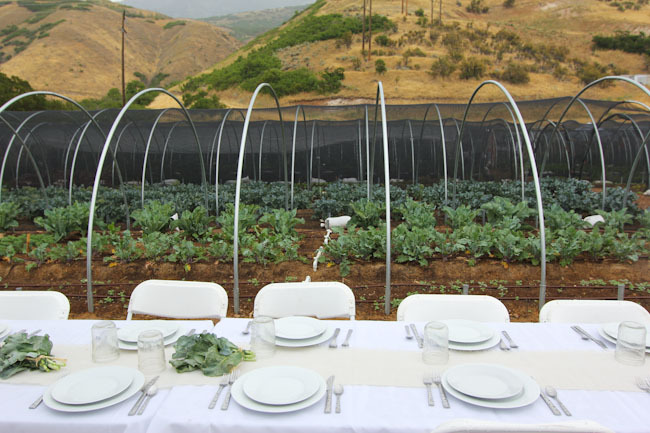 A couple weekends ago we visited his farm for a special dinner by Heirloom Group. We ate the freshest greens and vegetables while sitting under an umbrella in the rain. Basil at our feet and rows of produce all around us. We tasted faro with fresh sucked peas and corn, zucchini and squash with olive oil and feta cheese, and fresh greens with a light dressing topped with potatoes and beans. And that was just our salads. You can imagine the rest of the dinner was just as fresh and tasty. Because of the rain, we huddled under a few tents and ate our dinner standing, passing along each dish family-like, each taking our portion. 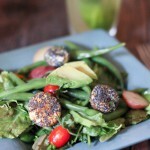 Here’s my take on the Farm Salad that we enjoyed that evening. I used greens and basil from La Nay’s CSA program, a dressing made from local Slide Ridge Honey Wine Vinegar, and added a few veggies from some of my friends gardens along with these goat cheese croutons that I created. 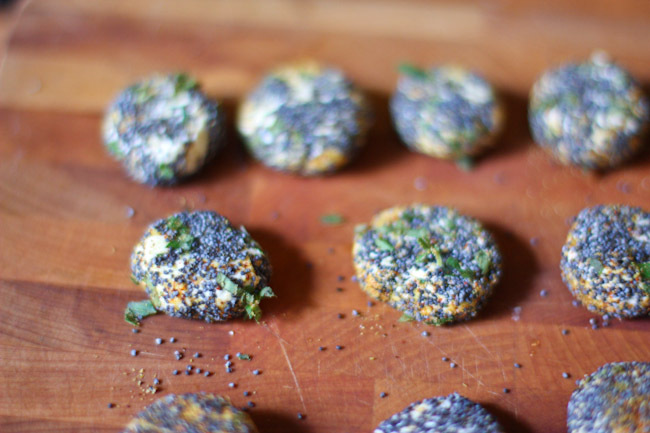 They are simply goat cheese rolled in spices and crunchy sesame seeds. 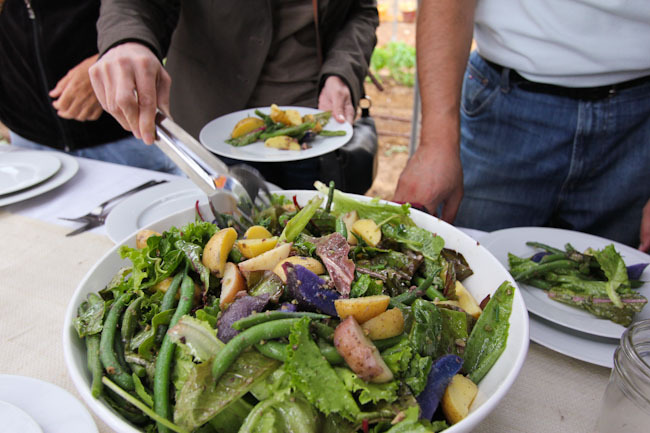 If you’re interested in participating in his CSA you can read more here on Lay Nay Ferme CSAs. 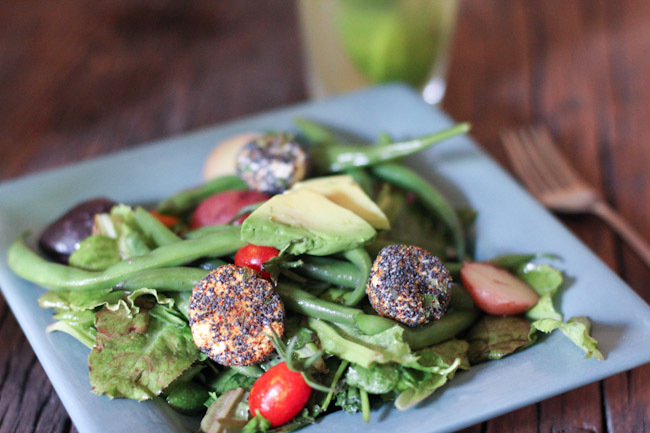 A simple harvest salad using farmers market produce. Mix first 6 ingredients in shallow bowl. Cut goat cheese into 1/2 inch disks. (roll into rounds then flatten if you need to). Dip goat cheese rounds into spice mixture to coat. Chill until ready to serve. Cover and chill. Bring to room temperature before serving. Whisk first 3 ingredients in small bowl. Gradually whisk in olive oil. Season with coarse salt and pepper. Cover and refrigerate. Rewhisk before using. Steam potatoes until just tender, about 10 minutes. Transfer to plate; cool. Steam green beans until crisp-tender, about 5 minutes. Rinse under cold water; drain. Pat dry with paper towels. Chill until ready to serve. Combine greens and basil in large bowl. Add enough vinaigrette to coat lightly; toss. Arrange on large platter. 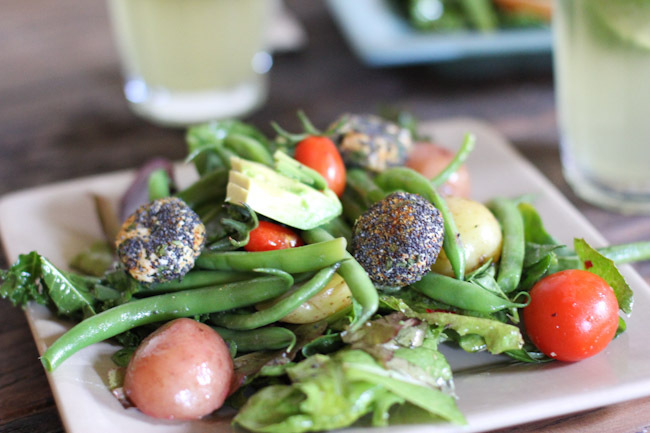 Add potatoes and green beans to same large bowl; add remaining dressing and toss. 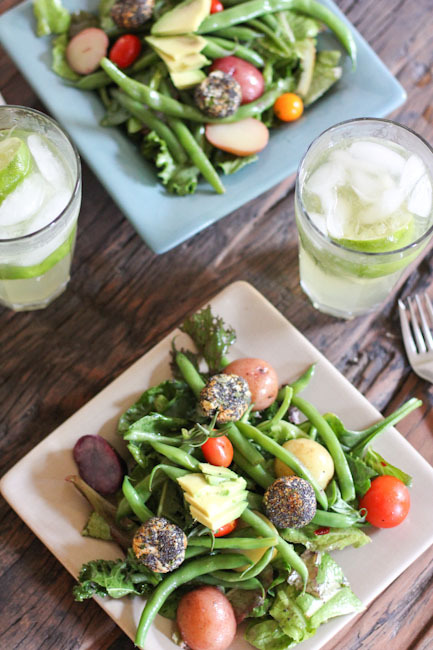 Arrange potatoes and beans atop greens. Scatter tomatoes over. Surround with goat cheese rounds. Stay tuned because this weekend we’re having our own dinner up at the Farm and are bringing in some of the best creative minds around the city to join our table. If you’re interested in joining us around the table or at onto f our future events visit slcmixers.com.